GamesPlanet has teamed up with Asus to gift one of their fans with a brand new gaming keyboard! 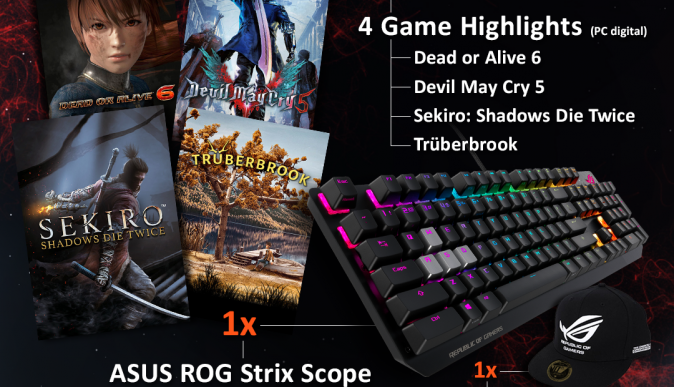 To enter in their latest Asus ROG Strix Scope Mechanical Keyboard Giveaway grab your free entries by following few simple steps listed down below! Extend your battlefield prowess with ROG Strix Scope, the mechanical gaming keyboard with Xccurate Design – an extra-wide Ctrl key for FPS precision. Enjoy colorful RGB Aura Sync backlighting, hit the Quick-Toggle Switch for work or play, and push the Stealth key for instant privacy. The keyboard is even finished with an aluminum faceplate for everyday resilience with a touch of style. Power to victory, with the power of ROG Strix Scope. The world-class ROG R&D team scrutinized the play style of FPS gamers, applying their findings to create a key that’s more than 2X broader than traditional Ctrl buttons. The result is Xccurate Design: the extra-wide Ctrl key for fewer missed clicks and greater precision. The keyboard also comes with four silver-hued keycaps for easy identification of the WASD control group, and even includes a keycap-puller tool for easy customization. Bonus entries: Share your referral link with friends to get an additional 6 entries for each person who enters through the link.